This chapter will describe two technically interesting and practical features: Foreign Data Wrappers(FDW) and Parallel Query. Currently, Section 4.1. FDW is only provided; Section 4.2. Parallel Query is under construction. In 2003, a specification to access remote data, called SQL Management of External Data (SQL/MED), was added to the SQL standard. This feature has been developing by PostgreSQL to realize a portion of SQL/MED since version 9.1. In SQL/MED, a table on a remote server is called a foreign table. PostgreSQL's Foreign Data Wrappers (FDW) are that use SQL/MED to manage foreign tables which are similar to local tables. Fig. 4.1. Basic concept of FDW. After installing the necessary extension and making the appropriate settings, you can access the foreign tables on the remote servers. For example, suppose there are two remote servers, namaly, postgresql and mysql, which have foreign_pg_tbl table and foreign_my_tbl table, respectively. In this exmaple, you can access the foreign tables from the local server by issuing the SELECT queries as shown below. localdb=# -- foreign_pg_tbl is on the remote postgresql server. localdb=# -- foreign_my_tbl is on the remote mysql server. Moreover, you can execute the join operation with the foreign tables stored in different servers which are similar to the local tables. Many FDW extensions have been developed and listed in Postgres wiki. However, almost all extensions are not properly maintained except for postgres_fdw, which is officially developed and maintained by the PostgreSQL Global Development Group as an extension to access a remote PostgreSQL server. PostgreSQL's FDW is described in detail in the following sections. Section 4.1.1 presents an overview of the FDW in PostgreSQL. Section 4.1.2 describes how the postgres_fdw extension performs. To use the FDW feature, you need to install the appropriate extension and execute setup commands, such as CREATE FOREIGN TABLE, CREATE SERVER and CREATE USER MAPPING (for details, refer to the official document). After providing the appropriate setting, the functions defined in the extension are invoked during query processing to access the foreign tables. Fig.4.2 briefly describes how FDW performs in PostgreSQL. Fig. 4.2. How FDWs perform. (1) The analyzer/analyser creates the query tree of the input SQL. (2) The planner (or executor) connects to the remote server. (3) If the use_remote_estimate option is on (the default is off), the planner executes EXPLAIN commands for estimating the cost of each plan path. (4) The planner creates the plain text SQL statement from the plan tree which is internally called deparesing. (5) The executor sends the plain text SQL statement to the remote server and receives the result. The executor then processes the received data if necessary. For example, if the multi-table query is executed, the executor perfoms the join processing of the received data and other tables. The details of each processing are described in the following sections. The analyzer/analyser creates the query tree of the input SQL using the definitions of the foreign tables, which are stored in the pg_catalog.pg_class and pg_catalog.pg_foreign_table catalogs using the CREATE FOREIGN TABLE or IMPORT FOREIGN SCHEMA command. To connect to the remote server, the planner (or executor) uses the specific library to connect to the remote database server. For example, to connect to the remote PostgreSQL server, postgres_fdw uses the libpq. To connect to the mysql server, mysql_fdw, which is developed by EnterpriseDB, uses the libmysqlclient. The connection parameters, such as username, server's IP address and port number, are stored in the pg_catalog.pg_user_mapping and pg_catalog.pg_foreign_server catalogs using the CREATE USER MAPPING and CREATE SERVER commands. PostgreSQL's FDW supports the feature to obtain statistics of the foreign tables to estimate the plan tree of a query, which are used by some FDW extensions, such as postgres_fdw, mysql_fdw, tds_fdw and jdbc2_fdw. If the use_remote_estimate option is set to on using the ALTER SERVER command, the planner queries the cost of plans to the remote server by executing the EXPLAIN command; otherwise, the embedded constant values are used by default. Although, some extensions use the values of the EXPLAIN command, only postgres_fdw can reflect the results of the EXPLAIN commands because the PostgreSQL's EXPLAIN command returns both the start-up and total costs. The results of the EXPLAIN command could not be used by other DBMS fdw extensions for planning. For example, mysql's EXPLAIN command only returns the estimated number of rows; however, PostgreSQL's planner needs more information to estimate the cost as described in Chapter 3. To generate the plan tree, the planner creates the plain text SQL statement from the plan tree's scan paths of the foreign tables. For example, Fig. 4.3 shows the plan tree of the following SELECT statement. Fig.4.3 shows that the ForeignScan node, which is linked from the plan tree of the PlannedStmt, stores a plain SELECT text. Here, postgres_fdw recreates a plain SELECT text from the query tree that has been created by parsing and analysing, which is called deparsing in PostgreSQL. Fig. 4.3. Example of the plan tree that scans a foreign table. The use of mysql_fdw recreates a SELECT text for MySQL from the query tree. The use of redis_fdw or rw_redis_fdw creates a SELECT command. After deparsing, the executor sends the deparsed SQL statements to the remote server and receives the result. The method for sending the SQL statements to the remote server depends on the developer of each extension. For example, mysql_fdw sends the SQL statements without using a transaction. The typical sequence of SQL statements to execute a SELECT query in mysql_fdw is shown below (Fig. 4.4). (5-1) Set the SQL_MODE to 'ANSI_QUOTES'. (5-2) Send a SELECT statement to the remote server. (5-3) Receive the result from the remote server. 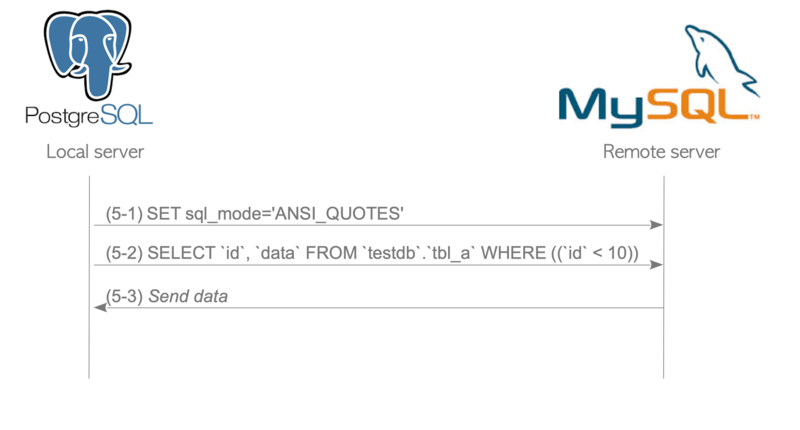 Here, mysql_fdw converts the result to readable data by PostgreSQL. All FDW extensions implemented the feature that converts the result to PostgreSQL readable data. The actual log of the remote server can be found here; the statements received by the remote server are shown. In postgres_fdw, the sequence of SQL commands is complicated. The typical sequence of SQL statements to execute a SELECT query in postgres_fdw is shown below (Fig. 4.5). (5-1) Start the remote transaction. The default remote transaction isolation level is REPEATABLE READ; if the isolation level of the local transaction is set to SERIALIZABLE, the remote transaction is also set to SERIALIZABLE. The SQL statement is basically executed as a cursor. (5-5) Execute FETCH commands to obtain the result. By default, 100 rows are fetched by the FETCH command. (5-6) Receive the result from the remote server. (5-8) Commit the remote transaction. Fig. 4.5. Typical sequence of SQL statements to execute a SELECT query in postgres_fdw. The actual log of the remote server can be found here. 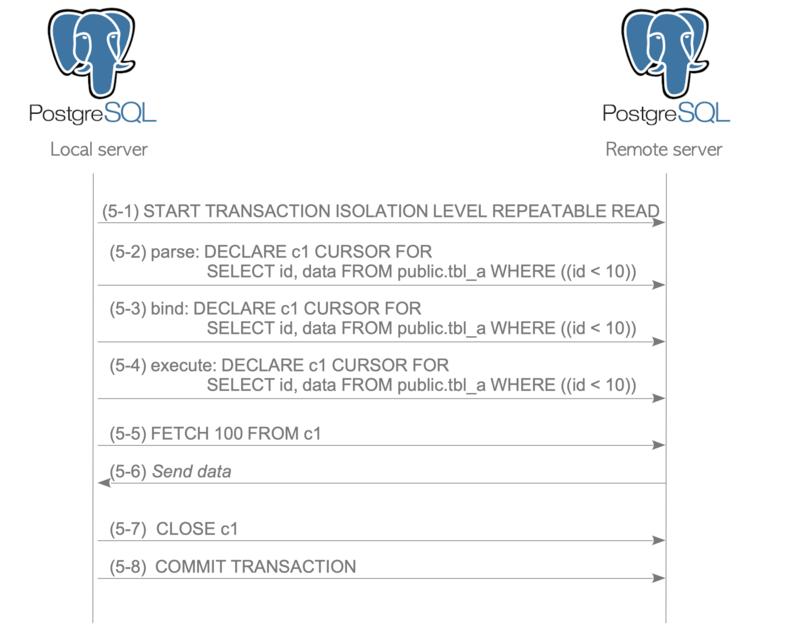 The default remote transaction isolation level in postgres_fdw. The explanation for why the default remote transaction isolation level is REPEATABLE READ is provided in the official document. 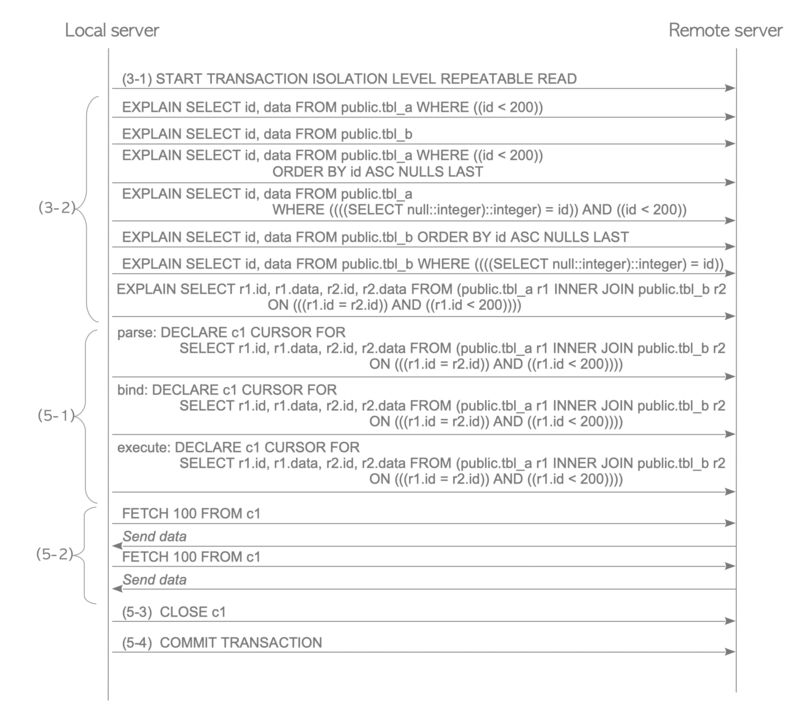 The remote transaction uses the SERIALIZABLE isolation level when the local transaction has the SERIALIZABLE isolation level; otherwise it uses the REPEATABLE READ isolation level. This choice ensures that if a query performs multiple table scans on the remote server, it will get snapshot-consistent results for all the scans. A consequence is that successive queries within a single transaction will see the same data from the remote server, even if concurrent updates are occurring on the remote server due to other activities. postgres_fdw extension is a special module that is officially maintained by the PostgreSQL Global Development Group and its source code is included in the PostgreSQL source code tree. postgres_fdw is gradually improved. Table 4.1 presents the release notes related to postgres_fdw from the official document. Table 4.1 Release notes related to postgres_fdw (cited from the official document). 9.3 postgres_fdw module is released. Consider performing sorts on the remote server. Consider performing joins on the remote server. When feasible, perform UPDATE or DELETE entirely on the remote server. Allow the fetch size to be set as a server or table option. 10 Push aggregate functions to the remote server, when possible. Given that the previous section describes how postgres_fdw processes a single-table query the following subsection how postgres_fdw processes a multi-table query, sort operation and aggregate functions. This subsection focuses on the SELECT statement; however, postgres_fdw can also process other DML (INSERT, UPDATE, and DELETE) statements as shown below. PostgreSQL's FDW does not detect deadlock. postgres_fdw and the FDW feature do not support the distributed lock manager and the distributed deadlock detection feature. Therefore, a deadlock can be easily generated. For example, if Client_A updates a local table 'tbl_local' and a foreign table 'tbl_remote' and Client_B updates 'tbl_remote' and 'tbl_local', these two transactions are in deadlock but could not be detected by PostgreSQL. Therefore these transactions could not be committed. To execute a multi-table query, postgres_fdw fetches each foreign table using a single-table SELECT statement and then join them on the local server. In version 9.5 or earlier, even if the foreign tables are stored in the same remote server, postgres_fdw fetches them individually and joins them. In version 9.6 or later, postgres_fdw has been improved and can execute the remote join operation on the remote server when the foreign tables are on the same server and the use_remote_estimate option is on. The execution details are described as follows. Let us explore how PostgreSQL processes the following query that joins two foreign tables: tbl_a and tbl_b. The result of the EXPLAIN command of the query is shown below. Line 8: The executor fetches the table tbl_a using the foreign table scan. Line 6: The executor sorts the fetched rows of tbl_a on the local server. Line 11: The executor fetches the table tbl_b using the foreign table scan. Line 9: The executor sorts the fetched rows of tbl_b on the local server. Line 4: The executor carries out a merge join operation on the local server. The following describes how the executor fetches the rows (Fig. 4.6). (5-3) Execute FETCH commands to obtain the result of the cursor 1. 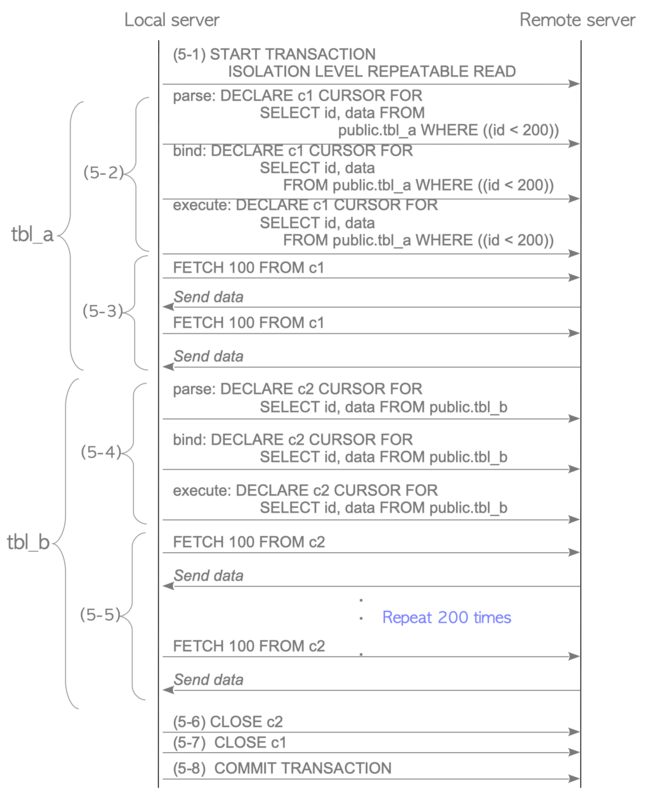 Note that the WHERE clause of the original double-table query is "tbl_a.id = tbl_b.id AND tbl_a.id < 200"; therefore, a WHERE clause "tbl_b.id < 200" can be logically added to the SELECT statement as shown previously. However, postgres_fdw cannot perform this inference; therefore, the executor has to execute the SELECT statement that does not contain any WHERE clauses and has to fetch all rows of the foreign table tbl_b. This process is inefficient because unnecessary rows must be read from the remote server via the network. Furthermore, the received rows must be sorted to execute the merge join. (5-5) Execute FETCH commands to obtain the result of the cursor 2. (5-6) Close the cursor c1. (5-7) Close the cursor c2. Fig. 4.6. Sequence of SQL statements to execute the Multi-Table Query in version 9.5 or earlier. After receiving the rows, the executor sorts both received rows of tbl_a and tbl_b, and then executes a merge join operation with the sorted rows. If the use_remote_estimate option is on (the default is off), postgres_fdw sends several EXPLAIN commands to obtain the costs of all plans related to the foreign tables. To send the EXPLAIN commands, postgres_fdw sends both the EXPLAIN command of each single-table query and the EXPLAIN commands of the SELECT statements to execute remote join operations. In this example, the following seven EXPLAIN commands are sent to the remote server to obtain the estimated costs of each SELECT statement; the planner then selects the cheapest plan. Let us execute the EXPLAIN command on the local server to observe what plan is selected by the planner. The result shows that the planner selects the inner join query that is processed on the remote server, which is very efficient. The following describes how postgres_fdw is performed (Fig. 4.7). (3-1) Start the remote transaction. (3-2) Execute the EXPLAIN commands for estimating the cost of each plan path. In this example, seven EXPLAIN commands are executed. Then, the planner selects the cheapest cost of the SELECT queries using the results of the executed EXPLAIN commands. (5-2) Receive the result from the remote server. (5-3) Close the cursor c1. Fig. 4.7. Sequence of SQL statements to execute the remote-join operation in version 9.6 or later. Note that if the use_remote_estimate option is off (by default), a remote-join query is rarely selected because the costs are estimated using a very large embedded value. In version 9.5 or earlier, the sort operation, such as ORDER BY, is processed on the local server, i.e. the local server fetches all the target rows from the remote server prior to the sort operation. Let us explore how a simple query that includes an ORDER BY clause is processed using the EXPLAIN command. Line 6: The executor sends the following query to the remote server, and then fetches the query result. Line 4: The executor sorts the fetched rows of tbl_a on the local server. In version 9.6 or later, postgres_fdw can execute the SELECT statements with an ORDER BY clause on the remote server if possible. Line 4: The executor sends the following query that has an ORDER BY clause to the remote server and then fetches the query result, which is already sorted. The actual log of the remote server can be found here. The workload of the local server has been reduced by this improvement. In version 9.6 or earlier, similar to the sort operation mentioned in the previous subsection, the aggregate functions such as AVG() and cont() are processed on the local server as the following steps. Line 5: The executor sends the following query to the remote server, and then fetches the query result. Line 4: The executor calculates the average of the fetched rows of tbl_a on the local server. The actual log of the remote server can be found here. This process is costly because sending a large number of rows consumes heavy network traffic and takes a long time. In version 10 or later, postgres_fdw executes the SELECT statement with the aggregate function on the remote server if possible. Line 4: The executor sends the following query that contains an AVG() function to the remote server, and then fetches the query result. The actual log of the remote server can be found here. This process is obviously efficient because the remote server calculates the average and sends only one row as the result. Similar to the given example, the push-down is an operation where the local server allowed the remote server to process some operations, such as aggregate procedures. © Copyright Hironobu SUZUKI All Rights Reserved.